On a few Sundays (this one included), SnowMyYard will build an artificial sledding hill, something that looked quite enticing last time. The website also talks about a 40-foot Ferris wheel, which will be new this year, and a carousel. The season runs from Dec-1 through Jan-31. This Saturday Dec-1, there will be a big kickoff event from 3p-9p. 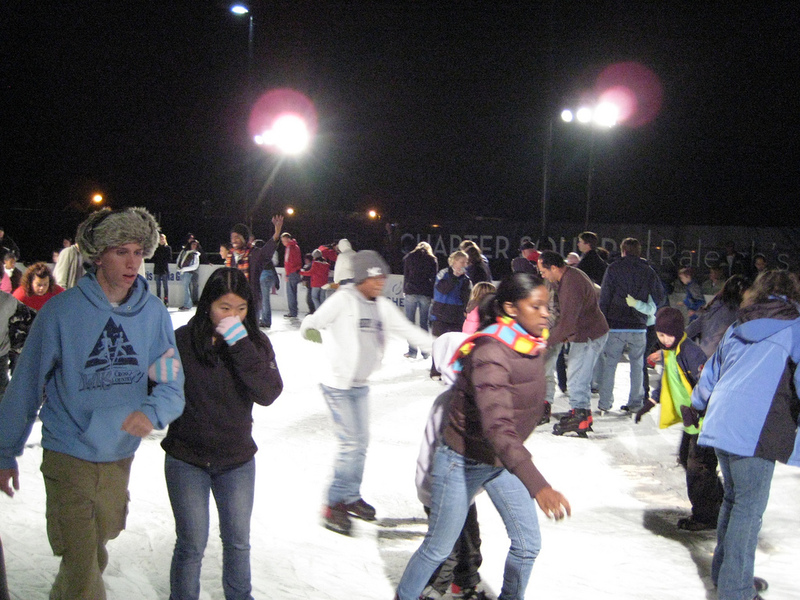 Live music, vendors, outdoors movie and general merrymaking will provide a joyful start of the season. Don’t miss it! $8 for skating, watching the Zamboni from the sidelines is free. Not just Raleigh has its fall festivals. I suggest that after Hopscotch and SPARKcon, you head out for a somewhat different program at the Benson Mule Days. First, where is Benson? Have you ever noticed that going to and coming from the beach on I-40, the signs say you’re going to “Benson”, but then you actually never go through Benson? Well, for future reference, “Benson” is code for “the intersection of I-40 and I-95”. 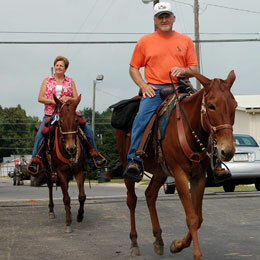 And Benson is also the location of the annual (63rd this year) Benson Mule Days. A long weekend filled with small town fun, rides, parades, a rodeo and many four-legged animals, mules and others. Here is the website and their program. Wait, didn’t we already have that? No, no, see: A few weeks ago, we had the Raleigh Fire Department Centennial Fire Truck Parade. 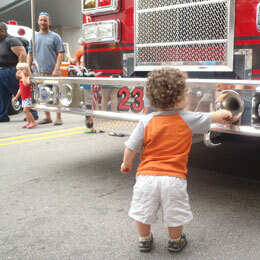 This weekend, we’ll see the South Atlantic Fire Rescue Expo’s Fire Truck Parade. The parade starts at 9 a.m., but be there early – it is a pretty short route. The trucks start at the capitol, go down Fayetteville and switch over to Salisbury at the end. After the parade is over, the trucks go to the static display, where they can be looked at from up close, climbed on and sat in. I may be a bit biased, because my son would happily go to a fire truck parade every weekend. But especially if you missed the last one, this is another opportunity to see some exciting vehicles. Some impressions from the previous parade can be seen on http://www.youtube.com/daddyweekly. No, this is a not a pun on a food truck rodeo. The Road-e-o is a competition for garbage truck drivers. As their website states, “Contestants representing public and private waste collection agencies will be competing […]. Drivers are required to maneuver competition vehicles through a preset course […].” The event is organized by the NC chapter of SWANA (Solid Waste Association of North America) and takes place at two locations, the South Wake Landfill at 6130 Old Smithfield Road in Apex, and (closer) at City of Raleigh’s Wilder’s Grove Operations Facility at 630 Beacon Lake Drive in Raleigh. It is officially a two-day event for the participants, but the main competition takes place on Saturday from 8a-4p. This is the NC regional. The winner and runner-up ill continue on to the National Championship in Kentucky. My son went through a phase of fascination with garbage trucks, and after seeing a ton of fire trucks last weekend, we need to pay the garbage trucks some respect! Thanks to go out to the loyal reader who sent in this event. Suggestions for posts are always welcome! The Raleigh Fire Department celebrates its 100th anniversary this weekend, and what better way to do so than inviting a bunch of kids! How do you get the kids to come out? Fire trucks. Big ones. Old ones. Steam-engine driven. Hand-pulled. Remote-controlled (to play with). And speaking of play: a Kids corner with a bucket brigade game and toy fire truck races. Here’s a suggested itinerary for the day: Get to your preferred spot along the parade route early for the best view. The parade starts at 10am on Hillsborough at St. Mary’s. It will travel along Hillsborough to the Capitol and continue down Fayetteville Street to the parking lots in front of the Performing Arts Center.That also where the fire trucks (properly called “apparatus”) will be on display along with the Kids Zone, a Pumping Exhibit and the usual stuff like food vendors, and, of course, a huge birthday cake. At noon, the antique steam engine driven fire engine will be demonstrated, and other ‘pumping displays’ (I assume that means splashing water in laymens’ terms) will happen before and after.